In an early-stage company, all leads are precious. They’re proof of product-market fit. They’re your route to revenue. They’re a great predictor of your company’s success. And if you’re like most sales teams, you’re letting them go to waste. Even if your team is closing deals, there’s a good chance you’re not making the most of every lead in the pipeline. Best case scenario, that means you’re kissing a lot of those precious leads goodbye, or not getting as much out of them as you could. That’s why it’s simply not enough to cross your fingers and hope that every rep is maximizing each deal. You need to dig deeper into your sales data to find how you can reduce cognitive strain and better optimize your reps’ time by re-routing leads. But how do you do that? By analyzing revenue per lead. This type of analysis will show you where to make improvements to the sales process to grow your business and make your sales team more efficient by highlighting where your reps’ time is best spent. Best of all, it’s a simpler process than you might think. On the surface, revenue per lead is a simple calculation. It’s the total amount of new revenue brought in by leads divided by the number of sales qualified leads (SQLs), usually over the span of the past quarter or year. It’s really important to make sure you’re calculating revenue correctly—only new revenue can be attributed to new leads. Anything else, like prepaid plans, should be subtracted from MRR before dividing by number of leads for the time period you’re analyzing. As an aggregate number, revenue per lead can tell you how much your leads are worth. It’s a solid way of assessing how much return you’re getting per each SQL, so you can do a cost/benefit analysis of how much you’re spending per lead, and how much you’re getting out of each one. But the real magic comes from getting granular with this data and segmenting your revenue per lead. Your reps are the atomic unit of your sales machine. Segmenting revenue per lead by individual sales rep is the best way to tell how those units are doing. In particular, revenue per lead can tell you what each rep’s strengths are, and how their time is best spent. After digging into the data and re-routing leads to maximize revenue per lead, Lemkin’s strategy boosted EchoSign’s revenue by 10%. In a recurring revenue business, that’s magic. Unlike revenue per bookings, or average deal size, revenue per lead can tell you how a rep’s sales activities relate to the top of the funnel. Even if a rep brings in a lot of revenue per month, these numbers can hide the fact that they’re actually wasting precious leads. Here’s an example. Your top sales rep hits double his quota each month and has the highest revenue per booking rate on your team. But if his revenue per lead is lower than your team’s average, something is wrong. It’s an indication that while he’s a really talented salesperson, you’re giving him more leads than he can handle each month, and should re-route them to other members of the team. When Jason Lemkin ran this analysis at EchoSign, he found that some reps could handle 200 leads per month, whereas others can only get to 100. After that, they weren’t able to follow up with all their reps, or just gave up on some of them, and were squandering all those precious SQLs. Think giving all your sales reps the same number each month is a good idea? Think again. Analyze your revenue per lead and you’ll uncover exactly how to fix that and assign the numbers that work best for them, and allow you to maximize all those SQLs. You can take this analysis even further by looking at each rep’s revenue per lead and segmenting it by customer type. 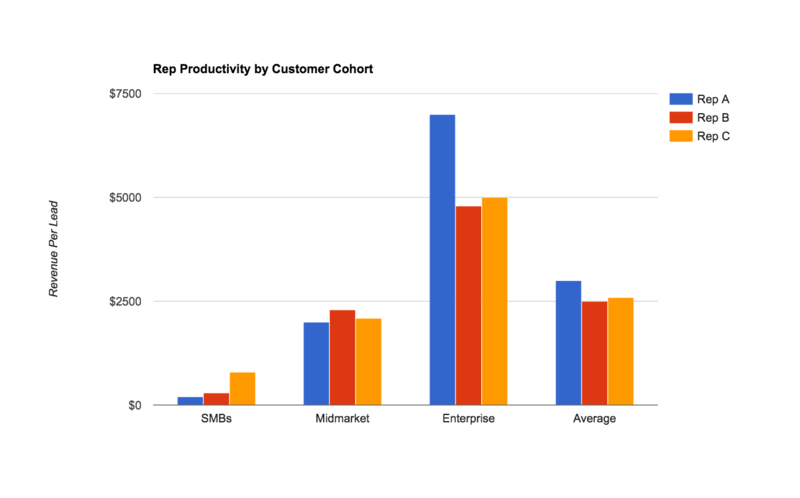 Let’s say you have three reps that are given an equal mix of SMB, mid-market, and enterprise leads. Their average revenue per lead might look very different, but if you break it down by rep and by category of lead, the numbers tell an interesting story about each rep’s individual strengths and weaknesses. If you take a look at the average revenue/lead that each rep brings in, it’s around the same. But a closer look reveals that there’s more of a difference. Rep A is killing it with enterprise, and probably wasting her time chasing after SMBs, since there isn’t much of a yield there. If she’s getting the same number of SMB leads per month as Rep C (who has a really high revenue per lead with SMBs), then a lot of those leads are going to waste. For example, one rep might not have a good talk track around competitors, which is more of a problem for SMBs who are seeking cheaper options. If you don’t look at revenue per lead per rep, you might never find that out. If you’re making under $20 million in ARR, you never have enough leads. That means that you absolutely have to optimize each one, and that requires doing a bit of research about how your sales team is working. As you calculate revenue per lead and learn more about how your reps deal with each kind of lead, you’ll learn more about how to maneuver the pieces around. As Jason Lemkin advises, “Route the right number of leads, of the right type, to the right rep… and you’ll see a real boost.” By figuring out how to best structure your sales team and assign your leads, you’ll boost revenue per lead to get the MRR numbers you’re looking for.